I have been looking for a little sweet treat that was both delicious and moderately healthy. I emphasize moderately. Basically, something that I could eat for breakfast and not feel totally guilty. Well, I think I found just what I was looking for in these raspberry oatmeal bars! What makes them a tad healthier than your garden variety oatmeal bars is that they are made with almond meal instead of flour and I made my own raspberry jam with chia seeds, so it has absolutely no sugar! I'd say that almost qualifies as a breakfast food. These oatmeal bars are very easy to make, even considering you have to make your own jam. Technically, you don't have to. You can just use a regular raspberry jam. But I like the idea of making my own because I can control the sweetness of it. And it's much easier to make than you'd think. In a small sauce pan, bring frozen raspberries, lemon juice, and honey to a simmer. Let simmer for 5-10 minutes until it has thickened slightly. Then remove from the heat and stir in the chia seeds. After about 20 minutes, the mixture will thicken even more, but won't be quite the consistency of a normal jam. While the jam thickens, move on to the oatmeal part of the bars. Combine almond meal, oats, brown sugar, and salt in a large bowl, then add cubes of cold butter. Use a pastry cutter or your hands to cut the butter into the dry ingredients until it forms a coarse crumble. To assemble the oatmeal bars, first pat half (or more than half) of the oatmeal mixture into the bottom of a square pan. Then pour some or all of the jam on top. Lastly crumble the rest of the oatmeal mixture on top. You don't need to form a solid layer, just sprinkle the rest overtop and pat down gently. Pop the pan in a 350 degree oven for 30 to 40 minutes, or until the oatmeal crumble on top has turned a lovely shade of golden brown. After they come out of the oven, let them cool on the counter for at least an hour. I would recommend making them at night then leaving them out until the morning. It will ensure that the jam has settled making them easier to cut. I know it will be hard to leave them be, but it will be worth it, I promise. The jam layer will be slightly more solid and not drip out everywhere, and the crumbs on top will be nice and crunchy. 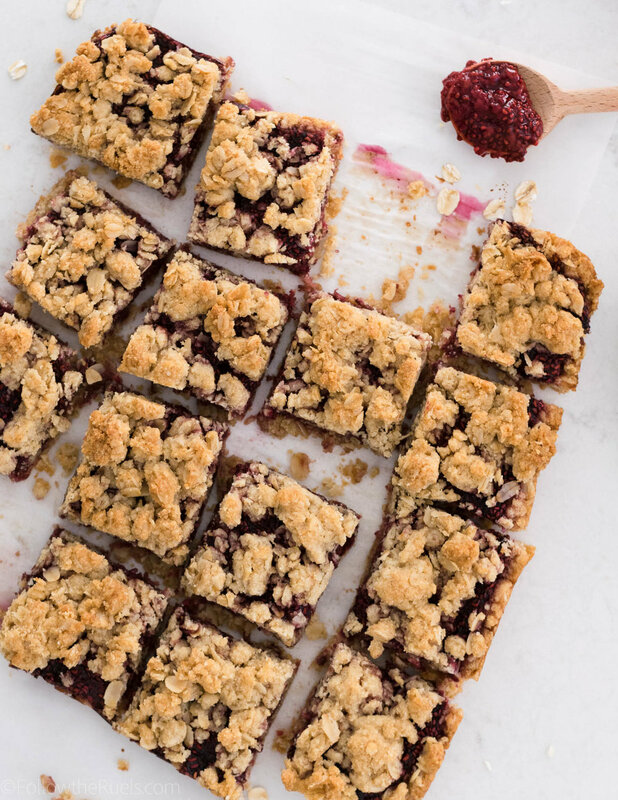 Your reward will be these perfectly crumbly and sweet raspberry oatmeal bars. I happen to love that the raspberry layer isn't overly sweet, so it perfectly balances the sweeter and nuttier oatmeal crust. Of course, feel free to substitute your favorite store-bought jam or swap out the raspberries for another favorite berry! Preheat oven to 350 degrees. Line a 8" or 9" square pan with parchment paper. Set aside. In a sauce pan, combine raspberries, lemon juice, and honey. Place over medium heat and bring to a simmer. Reduce heat, and continue to cook for 5 to 10 minutes until slightly thickened. Remove from heat and stir in chia seeds. Let sit for 20 minutes, until thickened and the consistency of a warm jam. Meanwhile, mix together the oats, almond meal, sugar, baking powder, and salt. Cut in the cubes of butter until the mixture forms a coarse crumble. Pour half of the oat mixture in the bottom of the pan and press down to form a crust. Spread the jam over top, using as much or as little as you like. Sprinkle the remaining oatmeal mixture on top and gently press into the jam. Bake for 30 to 40 minutes until the top has turned a golden brown color. Remove and let cool on the counter for at least an hour to allow the jam to set. Cut into squares and serve. Or keep covered on the counter for 1-2 days. Instead of making the raspberry chia jam, you can replace that with store-bought jam. Or you can swap the raspberries for another berry.